Chamber Music at the Clark concert seating is determined via lottery. The booking-by-lottery entry form for Zorá String Quartet concert seats posts here on Thursday, September 21, 2017. Lottery registration closes Thursday, October 12, 2017. 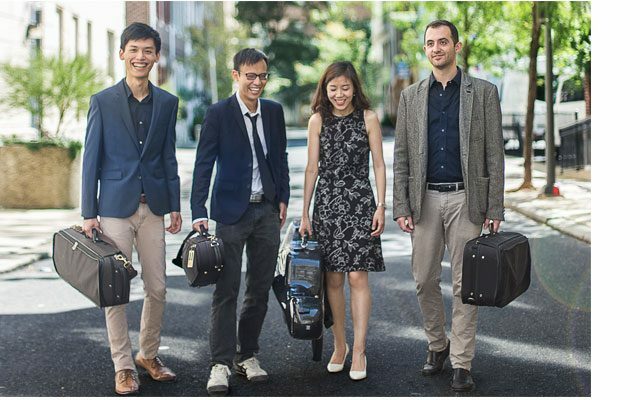 The Zorá String Quartet, recently named “the future of chamber music” in a concert review in Oregon ArtsWatch, met while studying at Indiana University. After they had been playing together for one year, they became the Quartet-in-Residence at Indiana University in 2014. The quartet gained national attention in 2015 when they won three major awards: the Young Concert Artists International Auditions, the Grand Prize and Gold Medal of the Fischoff Chamber Music Competition, and the Coleman Chamber Music Competition in California. As a result of winning the Fischoff Competition, they toured the Midwest and appeared at the 2016 Emilia Romagna Festival in Italy. In 2016, they were honored as the Quartet-in-Residence at the Curtis Institute of Music.